Peanut butter?! In a BURGER?! You read that right. This venison slider recipe is definitely not your standard slider. Unexpected and delicious, creamy peanut butter is the condiment you never knew you needed in a burger! Crispy bacon is also a key ingredient here. Add bacon to anything and it just makes it that much better. So, I encourage you to step outside your comfort zone and try this non-traditional burger recipe. My bet is you'll be pleasantly surprised. Divide ground venison in twelve parts and roll each into a ball. Press down on each venison ball to create a thin patty. Place a piece of white cheddar on six of the patties. You may have to fold the cheese slices so they fit inside the patties. Take the remaining six patties and place them on top of the cheese. Press edges together to seal cheese in. Sauté or bake 6 bacon slices until crisp. Set aside on a paper towel lined plate and pat dry. In a grill pan, add butter. Coat the pan with the melted butter and add venison patties. Allow to grill over medium-heat. Flip patties when grill marks begin to appear on the bottom, about 7 minutes. Cook the other side until browned and desired doneness is reached, 3 to 6 minutes depending on how rare you like your meat. Some of the cheese might seep out, and that's okay! While the second side of the patties are cooking, lightly toast all twelve halves of the slider buns on your oven broil setting. Watch them closely to make sure they don't burn! Plate slider buns and add a patty to each bottom half of bun. Spread 1 tablespoon of peanut butter on each venison patty. 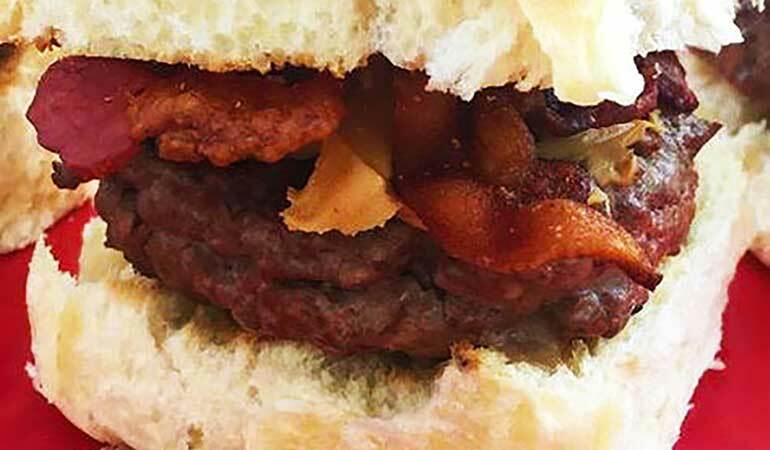 Break each piece of bacon in half and add two halves, side by side, to each slider. Add the top bun and enjoy.